END OF FINANACIAL YEAR 2016 - ALL BIKES AT KNOCK DOWN PRICES! 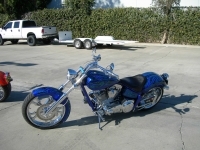 THE RIDE OF YOUR LIFE All Pro One bikes included in end of financial sale!! Every bike is a one-off so don't miss the opportunity to get Australia's best custom bikes. PRO-ONE has established an unparalleled reputation for superior quality, style, fine craftsmanship, performance and reliability. PRO-ONE is unmatched in its attention to servicing the needs of each and every customer. For over a decade our incomparable products and dedication to service has made PRO-ONE the company by which all others are measured. ON ROAD COSTS ARE NOT INCLUDED.